One of the most common odor problems in homes is pet odor. In order for you to better realize why you cannot just cover up pet odor, you must first understand the molecular structure of what is causing the odor. Fresh urine usually has little odor. The offensive urine odor doesn’t actually begin, until it starts to decay and release ammonia gas. A second level of decay will follow, which releases, mercaptam ( a foul-smelling organic compound) which comes from the same family of odor as skunk spray. Natural bacteria attack the urine as it breaks down, and digests the urea, sodium chloride, lipids, and phosphorus-and potassium-containing urine. 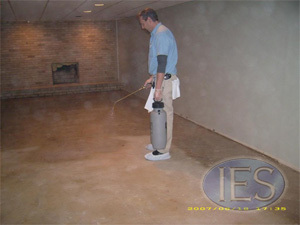 The bacteria leaves behind phosphate salts, which will stick to the carpet, making it extremely difficult to clean up. These salts are what release the odor, they need heat and humidity to do this. Some animals tend to urinate in the same area, as a result, the animal is applying heat and humidity to the area in question. The odor will become increasingly more pungent each time this occurs. A routine professional carpet cleaning will not remove these phosphate salts from your carpet. Special enzyme cleaners are required to do this, so be sure to inform Indoor Environmental Services of the nature of the problem while scheduling the appointment by phone.